The following originally appeared on 9/24/08 at Exit 51. This recipe is coming to you courtesy of last week’s Food Chat over at the Washington Post. The timing was perfect since I’m trying to find new and interesting ways to work those SB Friendly veggies into our meals. SFC has already established that he’s a fan of the sweet potato. But I didn’t know how he’d feel about squash. He came in the kitchen as I was cutting and chopping and asked, “Is that squash?” The tone of his question didn’t tell me whether he was excited or not. He went off to the basement, to do whatever it is he does down there, and I went back to getting the squash, shallots, and rosemary ready for their coating of salt, sugar, and olive oil. About thirty minutes later, after the vegetables had come out of the oven and the pork chops went in for a quick roast, he came upstairs. Making his way over to the cooling veg, he said, “Something smells good.” Before I could say a word, he started stealing bites off the sheet pan. Guess that means that he won’t mind if I make this again. I hope not, because I picked up another squash at the store this weekend. My only gripe with this is that there’s no reference to oven temperature. I started out with my oven around 400 degrees. After the first 20 minutes of roasting, I cranked it up to around 450. I think the squash was a little too crowded on the sheet pan. I had more of a steamed veg than a roasted one. No matter though. We ate it all. From The Washington Post, who credits it as being adapted from Fine Cooking magazine. This side dish achieves long-roasted flavor and caramelization in a half-hour’s time. To double the recipe, use 2 baking sheets; if roasting both sheets simultaneously, increase the final roasting time to 20 to 25 minutes. This can be made several hours ahead and reheated just before serving. 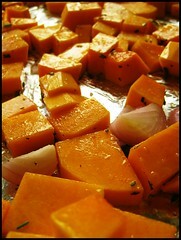 Distribute the diced squash and quartered shallots in an even layer on a large rimmed baking sheet. Drizzle the olive oil over them and toss to coat evenly. Sprinkle the rosemary, salt, sugar and pepper over the vegetables and toss to coat. Roast for 20 minutes, stir the vegetables and continue roasting for 10 to 15 minutes, or until all the vegetables are tender and lightly browned. Adjust seasoning to taste and serve hot. Jennifer, this recipe is so good that I’ll crank up the oven anytime of year for some roasted squash goodness. Haha. Men and their basements/dens/man caves/bathrooms. If you roast it, they will come. Ali, I need to find a way to work that line into the blog…if you roast it, they will come…because it’s absolute truth. Mmmm, shallots! I adore them. Jenna, I had some recently that were braised and caramelized. They were heavenly. Anna, you’re getting into the time of the year when you can happily crank up your oven and roast away. The Mistah and I are both known for picking the good bits off of the pan. Perfect ingredients; if you say olive oil and rosemary in conjunction with almost anything…I’m in! This is one of the few vegetables that I will do a Sandra Lee with..Costco sometimes has butternut squash available that is packaged already cut into cubes. I buy it every time I see it; I do love that convenience for making a dish with something I love. Barbara, I wish I would have thought of Costco for peeled and cubed squash yesterday. I now have a 3 lb squash on the counter that needs to be peeled and cut…and I can’t talk The Mistah into doing it for me.